It is with great pleasure that we welcome you to Whitman College. As you begin your inaugural semester at Whitman, we invite you to familiarize yourself with the Divest Whitman campaign. Three years ago, a group of students formed Whitman’s contingent of the globally active fossil fuel divestment movement. The group has since grown into one of the most effective student activist organization on campus. With enthusiastic support from students, faculty and alumni, Divest Whitman asks the Board of Trustees to divest from fossil fuels thereby aligning its financial practices with the College’s institutional principles. An overwhelming consensus within academia recognizes the urgent crisis of climate change. We are proud of the steps Whitman has taken to claim responsibility for this crisis apparent in the work of our environmental studies program and various environmental initiatives. Yet, these actions exist in complete opposition to Whitman’s financial policies. Administrators and board members have failed to take steps to acknowledge the College’s institutional role in perpetuating systems of oppression and degradation: The board continues to invest in fossil fuels. Last winter, Whitman faculty passed a resolution with nearly unanimous support advocating for divestment. 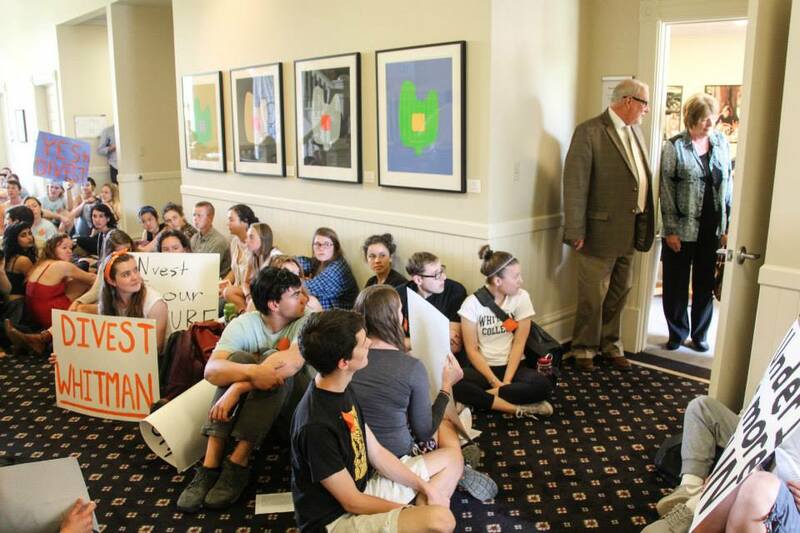 Later that spring, students voted 85 percent in favor of divestment, and 272 students, faculty, and staff sat in Memorial Hall to protest the Board’s inaction. With this in mind, we challenge you to match the conviction of the majority of the Whitman community who has agreed that as an institution we do not endorse, nor do we believe in profiting from, the destructive practices of the fossil fuel industry. When the Pitzer College Board of Trustees unanimously approved fossil fuel divestment along with a comprehensive climate action program last year, the plan was praised as “historic” and “innovative.” Whitman can still take a comparable leadership role and demonstrate that college financial practices can align with the missions that educational institutions pledge to promote. You have the power to move Whitman considerably closer to this goal. President Murray, we’re counting on you to join our fight for climate justice. website, I like the design and style it really stands out. Sweet internet site, super style and design, rattling clean and utilise friendly. content seem to be running off the screen in Ie.